Imagine the NHL’s Mike Babcock standing behind the bench of your son’s Don Mills Flyers Peewee hockey team; the NBA’s Gregg Popovich drawing up plays for your Caledon Cougars Midget girls basketball team; or Bill Belichick patrolling the sidelines for your child’s Mississauga Football League Atom team. That, in essence, is what members of the Mississauga Pakmen Volleyball Club will be treated to this summer at the club’s Elite Beach Training program. 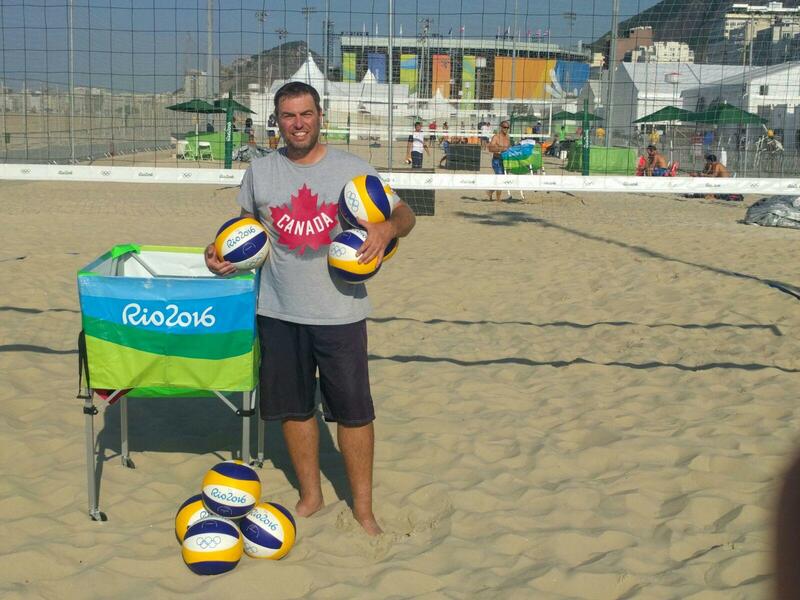 Canadian Olympic Beach Volleyball coach (Rio 2016) Lennard Krapp will lend his vast expertise and international experience to the club’s rep players competing in the Ontario Volleyball Association (OVA) Summer Beach League. While Krapp has participated in the program since 2013, he will now oversee the 12-18 year-old girls and boys groups beginning May 29 and running through August 14, with the knowledgeable assistance of Jessy Satti, Niko Rukavina, Kadeem Clarke and Aleks Mamuzic. Along with his vast experience as a player and coach, Krapp will draw on his Sports Science and Psychology degrees from the well regarded Christian-Albrechts University of Kiel, which has produced no fewer than 10 Nobel prize winners, to better prepare and motivate the club’s youngsters to improved results on the beach. Satti adds Krapp is equally adept at coaching players of varying abilities from Olympians to novices. Satti feels Krapp’s comfort level must come from his extensive career. “It must be his experience,” said Satti. “He’s been coaching for so long, I feel like he’s found his own way to deal with athletes of all skill levels. Those words can be backed up by results. Players training under Krapp have acrued over 50 medals on the world stage in the past 33 years. Krapp’s illustrious career began with his involvement with the Bundesliga from 1984-2000, followed by being put in charge of identifying Germany’s up-and-coming stars through national training centres and boarding schools that he started. That group of young stars who Krapp coached, included eventual 2012 Olympic gold medalists Julius Brink and Jonas Reckermann, as well as 2016 Olympic gold medalist Laura Ludwig. Krapp’s successes continued with his hiring by Volleyball Canada to head up the Beach National Team, which has led to a number of strong international performances, including gold for Garrett May and Sam Schachter at the U21 World Championships. Other notable Canadian athletes Krapp has coached include, Josh Binstock, Sam Schachter, Daniel Dearing, Sergey Grabovsky, Chris Towe, Will Hoey, Will Sidgwick, Sven Trodel, Tia Miric, Sophie Bukovec, Victoria Altomare and Julie Gordon. “Lennard is a technical genius,” asserts Canadian team member Dearing. “He coached me from 2008-2011. And again as a personal coach in 2013. 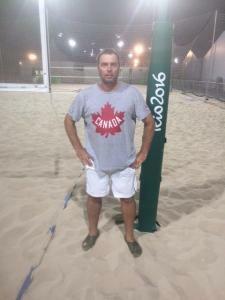 And now Krapp, who was born to Canadians in Hamburg, is poised to elevate the Pakmen program, which began in 2003 and has routinely produced Provincial and National beach champions, even higher. An A-level certified indoor and outdoor volleyball coach, the highest German certification level there is, Krapp offers a special insight to the game, few coaches in Canada can. “Germany’s volleyball is highly competitive,” explains Krapp, “because they have a professional indoor league and a professional national beach tour. Those are some of the reasons Volleyball Canada approached Krapp in 2009. Those who learn from him, whether in York, or with the Pakmen, procure a level of expertise in the sport few are ever privy to. “For example I am applying the ‘differential motor learning method’ when teaching skills like setting or spiking. “I have been involved in extensive studies, including my own masters thesis, that analyzed the structure of the game. We have analyzed Olympics, World championships, National championships, as well as Youth and Junior competitions. Knowing how often and with which efficiency certain skills and tactics are utilized at a Youth, Junior, or adult competition, one can prepare the athlete for the next level. Phillip Rodrigues, who has been with the club for a number of years, explained the major advantage Krapp has at the position of a teacher. Krapp has enjoyed his involvement with Olympic athletes, but finds teaching members of the Pakmen club has been a real treat due to the youngsters’ focus and eagerness to learn. And now, Krapp has the opportunity to work with the club’s girls as well. Krapp, whose wife Ulrike is a star player and coach in her own right, will work with the girls once a week and the boys once a week. He will also run the Friday training program.